Crappy Inu Yasha Comic #3! 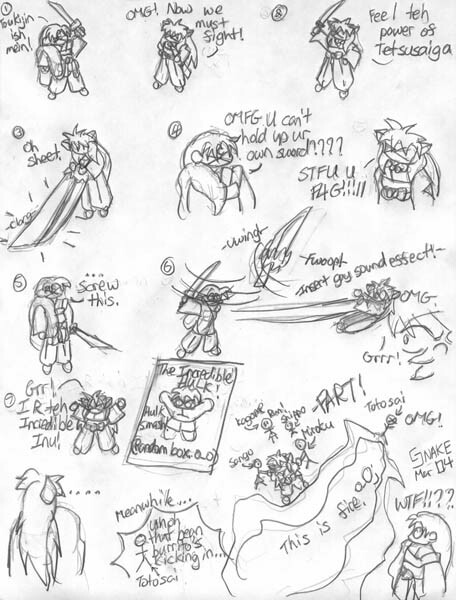 Home » Snake_Eyes » Pictures » Crappy Inu Yasha Comic #3! My bad, forgot explaining. This is a short summary of the ep where Sess takes Toukijin, the ebil sword made by Totosai's deciple gone wrong. o.o Anyways, this shoulda been Crappy Inu Comic #2, but I thought of the idea after I made Crappy Comic #2. Favorites... 124 Keywords Inu, Yasha, crap. LOL! when I read this, I just watched the episode this morning 9/13/08! omg!!!! I LOVED this episode! And yes, Seshy really did go "WTF??" when the fire thing happened, and then "SIT!" and Seshy was all like "gah...?" omg ur so random i love it favs! !